Business education at the University of Ulster’s Magee campus is poised for a new era with confirmation that Ireland’s largest accountancy body has given official recognition to an innovative degree course. It is the first time that an accounting course at Magee has been endorsed by Chartered Accountants Ireland (CAI), which is the profession’s longest established body here. The endorsement means that successful students on the full-time BSc Accounting and Managerial Finance programme will emerge from their three-year course with an officially recognised qualification and a head start in their professional career. Professor Deirdre Heenan, Acting Provost and Dean of Academic Development, said: “I congratulate the dedicated academic staff who have achieved this signal honour. “This degree with CAI accreditation fills a significant gap in accountancy education in the North West and is a landmark in the University’s expansion of professional services provision at Magee. With CAI recognition, the course’s content satisfies the requirements and standards of Part One of the CAI’s three-part professional examinations and, as a result, graduates gain exemption from it. This will make the graduates more attractive to potential employers and should put them on a higher starting salary than fresh unqualified recruits to the profession. Dr Lisa Bradley, Head of the Department of International Business, which is part of the University’s Ulster Business School, made the announcement during a visit to the North West by CAI President Mr Paul O’Connor and Deputy President Mr John Hannaway. Mr O’Connor said CAI was very pleased to be associated with the innovative degree. “It is especially gratifying because this is the first time that a degree course undertaken at the Magee campus carries CAI professional exam exemptions. The specialist programme was launched last September, when it was hailed as an important step forward in the University’s plans for radical expansion at Magee. Teaching staff have wide practice and academic experience and maintain close links with professional bodies. The teaching academics include Professor John Ward, who is a leading expert in taxation in Ireland and the UK, and Visiting Professor Gerry Murray, one of the North West’s best-known chartered accountants. Dr David McAree, the course director, is Chair of the Irish Accounting Finance Association. Chartered accountant Claire McAteer, a past pupil of Thornhill College, Derry who has worked for two of the 'Big Four' accountancy firms, lectures in Accounting. Dr Bradley said: “The CAI’s imprimatur sets Magee’s financial services provision on a new plain. As the course develops and the number of undergraduate places increases, it should prove to be a launch-pad for many successful careers in accountancy and financial services. Professor Marie McHugh, Dean of the Ulster Business School, described the CAI accreditation as “a very significant enhancement of our existing portfolio of successful under-graduate and post-graduate programmes at Magee”. 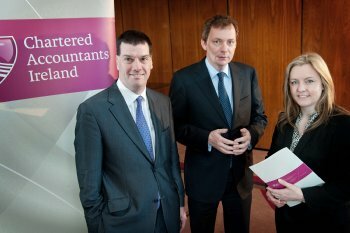 Caption: CAI President Mr Paul O'Connor (centre) with Dr Lisa Bradley, Head of the Department of International Business at the Magee campus of the University of Ulster, and Dr David McAree, course director on the BSc Accounting and Managerial Finance degree at Magee which has received official CAI accreditation.